A catalog called Simply Be arrived in my mailbox recently, and though I'd never heard of the company — selling US sizes 10-28 — I was pleasantly surprised by what I saw in the pages. Simply Be sounds like a catalog in which you might find supermodels doing downward dog in the wildflower-strewn yard of a ramshackle farmhouse while wearing heirloom Lycra. But no. 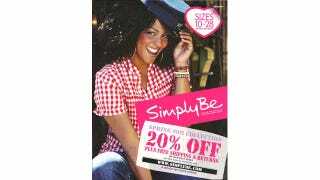 Simply Be offers "British and European fashion without limits." Most of the brands — Joe Browns, And Abigail, Angel Ribbons — I'd never heard of. But most of the clothes are on-trend and cute. Prices vary; the crochet-trim top here is a rather affordable $40, the summery tiered tunic is a kind of pricey $65, and the maxi dress is a splurge at $97. So often, plus-size clothing lines involve plain, tent-like pieces; Simply Be's pretty, feminine florals for spring are a breath of fresh air. That $75 green tunic on the right really wants to be in my closet. It's exciting to see plus-size clothing being modeled by happy ladies! Kudos to the casting director for choosing a blond, a brunette and a black woman. I do wish that some of these tops were a little more fitted and less maternity-ish… banded, dropped waistlines, maybe? But when so much is so cute, it's easy to overlook the stuff that doesn't work. This adorable lace dress is a whopping $105, but can be dressed up or down (rationalizing!). The fluttery garden blouse is $73. The "plus size party wear" is more fitted, sexier, edgier. Snake print jeans! And the chances you'll run into someone else wearing the same thing — which happens all the damn time for me with Old Navy — are pretty slim. I've got my eye on the printed dress, second from the left. The jeans are a little scary. The waists seem terribly high, and the fading has that "dragged behind a truck" look I try to avoid. Wow Jeans, as in, "wow, those are not good." Still, my overall feeling toward the catalog is a positive one. And as long as they're offering free shipping and free returns, I'm willing to take a chance.